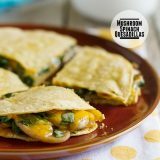 Hearty and filling, you’ll never miss the meat in these vegetarian Mushroom Spinach Quesadillas! Can you believe that it’s been almost a full year since my last cookbook review? Blogging is continuously evolving and changing. I’ve been actually doing a lot of thinking lately, and remembering why I got started on this whole journey in the first place. I will be entering my 8th year of blogging at the end of this month. And to say that things have changed since I hit publish on that first post 7 years ago would be an understatement. I have loved the journey, but lately, I’ve been missing the good ol’ days. One of those things that I’ve been missing are my cookbook reviews. I used to do them regularly, but in the evolution of blogging, they are one thing that got cut. Well, hopefully they will become more regular around here, because this is one part of blogging that I truly do love. I love cookbooks. Reading them, cooking from them, getting inspired by them. And while these reviews are a little more work, I want to get back to what I really enjoy, and hopefully they are something that you all really enjoy as well. Now this book. It was a total impulse buy. I needed a couple of things on Amazon, and they were small, so I figured that I needed something else because heaven forbid Amazon sends me something in a little tiny box. (Actually, I figured they’d still probably send me a big box with just a lot of filler – might as well find something else to fill it up!!) 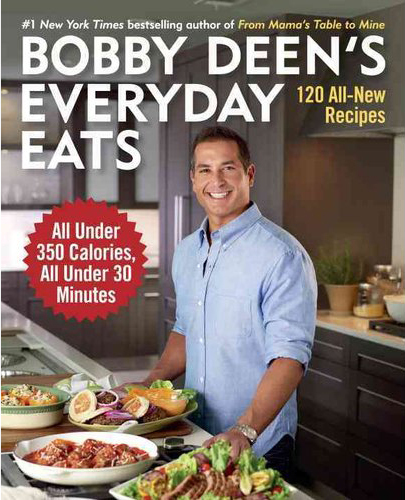 I was browsing through the cookbooks, and Bobby Deen’s Everyday Eats caught my eye. 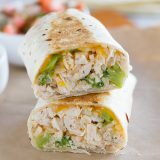 All of the recipes in this book are under 350 calories, and take under 30 minutes to make. I’ve been trying to make things a little healthier, so I thought this would be a great one to add to my collection. I usually like to flip through the pages of a cookbook before I buy it, but luckily I think I have a good one on my hands!! The photos are very well done. And while there isn’t a photo of every recipe, there is probably one photo to every 3-5 recipes. There are also some personal photos sprinkled in throughout the book. With all of the recipes having a 30 minute time frame, you don’t get into anything very difficult at all. The beauty of the recipes is that they are simple – both in technique and ingredients. Which I love. Most of the recipes have simple, whole ingredients. I didn’t notice any ingredients that you wouldn’t be able to find in your regular grocery store. I love salad, so I knew I would like this one, but I was surprised to find that I actually loved it. 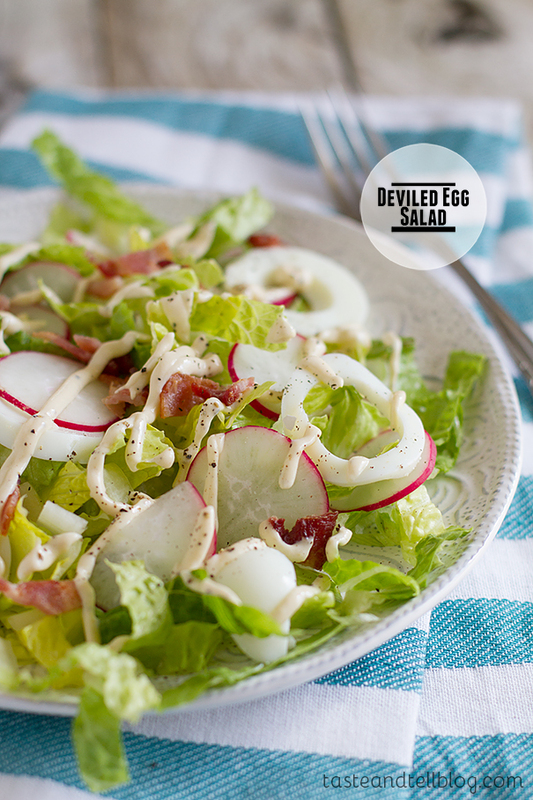 I didn’t think the deviled egg idea would come through as much as it did, but the dressing totally made me think of deviled eggs. The original recipe called for turkey bacon, and honestly, I do not like turkey bacon, so I used pork bacon. Totally worth the extra calories, in my opinion!! This is a classic, and a favorite. 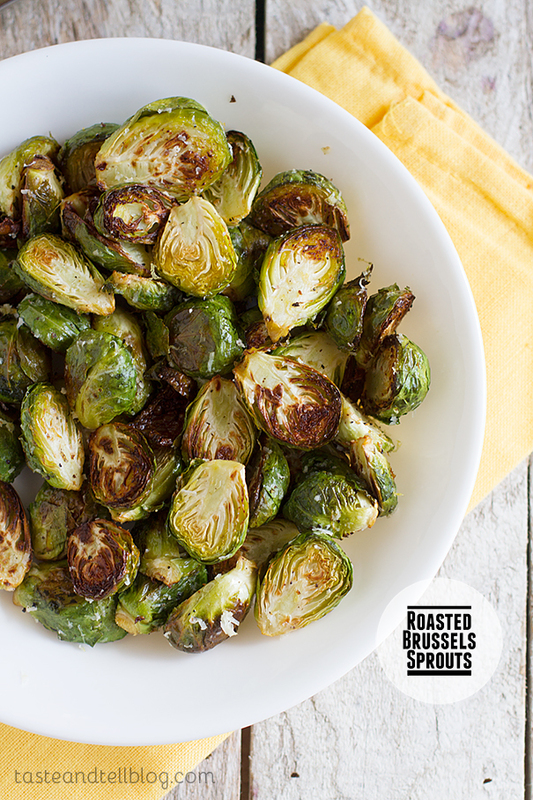 I actually chose to make this recipe because I had some Brussels sprouts in the fridge that needed to be used, and this was the perfect way to use them. 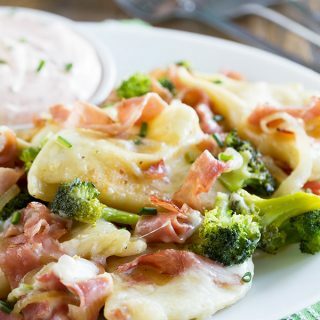 These get sprinkled with some parmesan cheese after they come out of the oven, which adds a wonderful flavor to them. I already think that this cookbook is a winner. 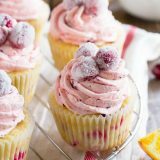 If it has one weak spot, it’s the dessert section, as most of them are either just glorified sweetened fruit or made with whipped topping (aka Cool Whip). 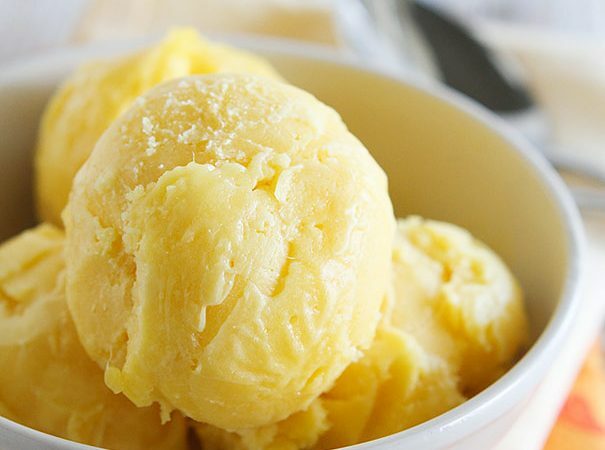 But really, if I’m going to have dessert, I’d rather go all out once a week than have “lighter” desserts a few times a week, so a lower calorie dessert doesn’t even really interest me. I love that the nutritional information is included, and I love that there is such a wide variety of recipes. My favorite part, though, is that the recipes don’t scream “diet” or “low calorie”. Heat the oil in a large skillet over medium heat. Add the onion and cook until softened, about 5 minutes. Add in the mushrooms and continue to cook until soft and tender, another 5-10 minutes. Add in the red pepper flakes, then season with salt and pepper. Stir in the spinach and cook until the spinach has wilted. Place the oven rack 4-5 inches from the heat and preheat the oven broiler. Place the tortillas in a single layer on a baking sheet. Place the sheet in the oven and bake until the tortillas are golden, 1 to 2 minutes. Remove from the oven. Remove 4 of the tortillas. Divide the mushroom mixture between the 4 tortillas on the baking sheet. Sprinkle with the cheese, then place back in the oven until the cheese has melted, 1 to 2 minutes. Remove and sprinkle on the cilantro, then top with the reserved tortillas. Serve with the salsa. 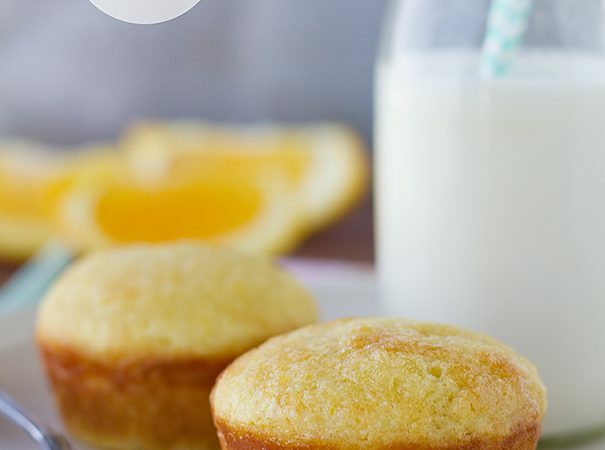 I can see why you wanted to try this recipe! Mushrooms, spinach, and melty cheddar cheese sandwiched between two tortillas. What’s not to love?! 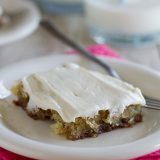 I do so hope that the cookbook reviews are back, because I loved them! They were always so useful in deciding which cookbook I want to buy next! I’m so glad to hear this was a winner…and now I’m totally craving those quesadillas. I’m going to look into getting this cookbook. I don’t have any of the Deen family cookbooks which is practically a sin-but something I hope to rectify soon. Well, you know I do a Meatless Monday every monday pretty much and we love that! But while I do have specified themes for certain nights of the week (the kids really dig it) it can get hard. 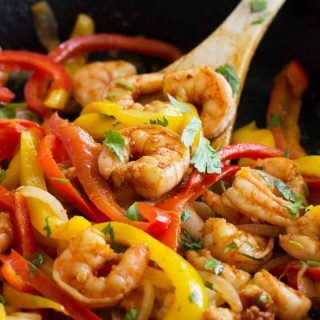 And since I tend to indulge a bit more on the weekend with our dinners, I try to make our Mon-Fri night dinners relatively low in calorie (not an easy thing to do on a Taco Tuesday) but this sounds like it fits the bill. 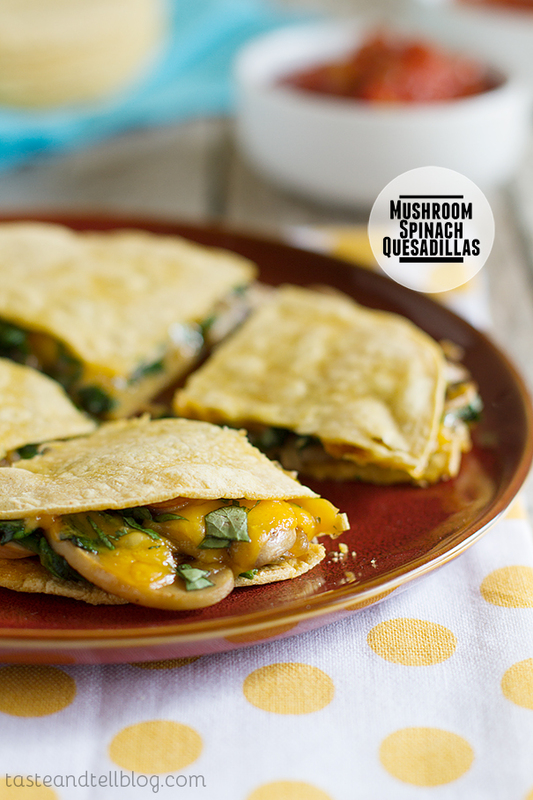 These cheesy mushroom quesadillas look incredible, Deborah! Sounds like a fab cookbook! 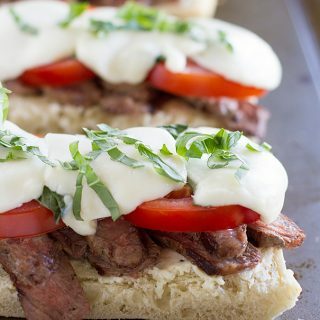 Just made these for lunch today–delish!! 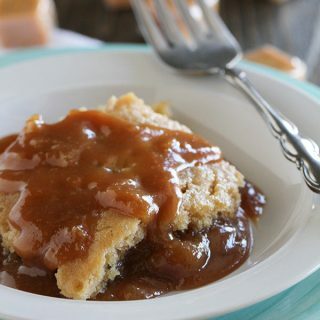 I’m for sure remembering these because they were quick and more filling than the crust off my boys pb sandwiches! !